I consider myself to be a pretty decent cook. For the most part, I follow recipes and it all works very well. I am choosy about the recipes I pick, I only make stuff with a 4+ star rating. I read the reviews carefully and take the other comments into consideration before I make a dish. I am a thoughtful cook. This doesn’t happen to me very often, but last night’s dinner was an abysmal failure. Like really, really bad. That roast beef was such a disaster, I had to throw it away. I hate throwing food away. I had visions of choking, this beef was so tough. I tried to get Oliver to eat it (after cutting it into the smallest pieces ever) and he said he didn’t like the “crunchy” meat. Yeah, I don’t blame you honey. Me either. He also didn’t like the rice. He loves rice! Part of the reason I made this recipe was the rice! It was long grain, white rice cooked in chicken stock, butter and salt – I mean, what’s wrong with that? 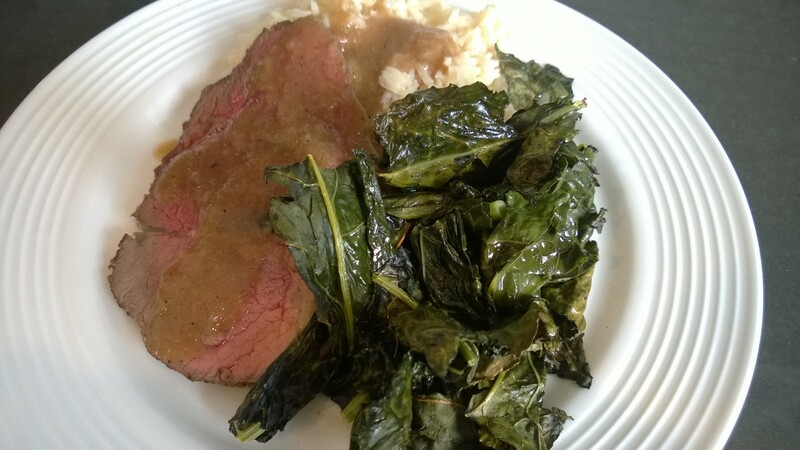 It was actually pretty good, especially with the gravy from the roast, which did turn out deliciously. But he wouldn’t eat it. He did however, eat the roasted kale, so I got that goin for me. Look, I’m sure the recipe is actually great, I just totally f’ed it up. I think things broke down with the cooking time/temp. 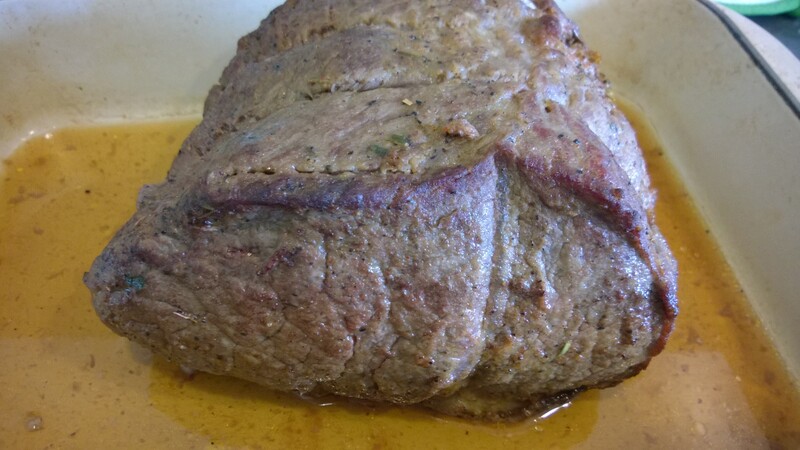 The recipe called for cooking a 3 – 3.5lb rump roast at 275° for 1.5 – 2 hours, until the internal temperature reached 130°. I bought a smaller roast, 2.5 lbs, used my oven’s temp probe, and made the decision to cook at 325° (other roast recipes cook at that temp, it wasn’t that crazy) since it was getting a little later than I anticipated. The internal temp got to 130 in about 40 minutes, but the meat was clearly just not done and I had to continue putting it back in the oven. Meat no worky. Please, please send me a recipe for your favorite Sunday roast. I need help. I figure I should be honest with you about the failures so you know I don’t just say everything I cook is amazing. It ain’t and this wasn’t. Just keepin it real. Take the roast out and let it sit for another 20-30 minutes covered. This is called resting. It will continue to cook and lock in juices. I do a roast every Sunday (nearly) and once you get them down, they are super easy. I like to cheat a bit and use my Le Crueset roasting dish covering after I have browned the top a bit.. Nothing ever comes out of that thing, tough. I don’t tent to follow a precise recipe just throw some onion, celery, carrot, potato in with a glass of red wine (oh shucks gotta open a bottle), olive oil, salt (quite a bit), pepper (be liberal) and a cup of beef stock. Throw that into the oven until my thermometer reaches 140 and then take it out. Wait 20-30 minutes (AKA- make some sides and gravy with the Au Jus if you like), and cut (resting also helps get those thinly slices). If you cut it open after resting, and it is not well enough for you, take the slices and wrap them up in tinfoil or chuck them back in the Le Crueset and cook for 10 more minutes. The thin slices make it cook faster- not optimal, but if everything else is ready / over cooked it can save a dinner. I’ve learned more from screwing up than getting things right. My lamb shank is just now reclaiming those I alienated, but I got there.